The Laurent Function Venue at Lourensford Wine Estate in the Cape Winelands offers its guests a lovely light-infused space that spills onto a veranda and takes in an impressive view of the vineyards and the Helderberg mountain range. The Events Draping Co. was at Lourensford on a blissful autumn afternoon to strip drape the ceiling for a May wedding on behalf of wonderful event coordinators Dapper Events. 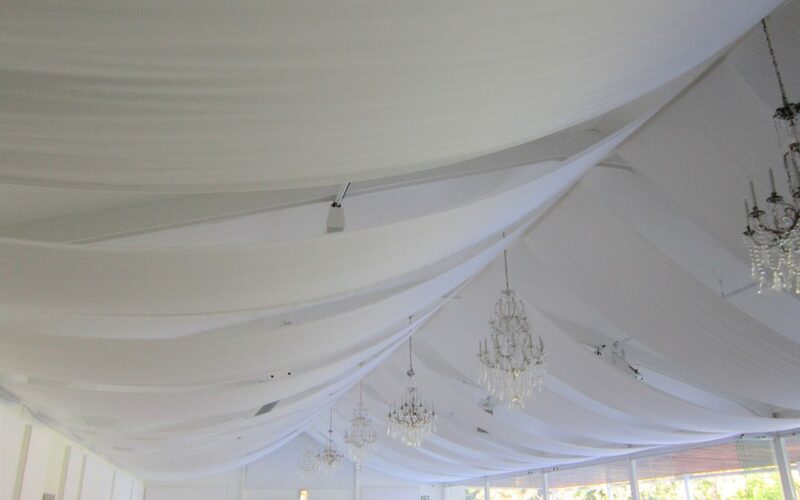 The draping team hung strips of bright white fabric from the centre of the ceiling out to the sides to create a series of perfectly parallel swags for the happy occasion.